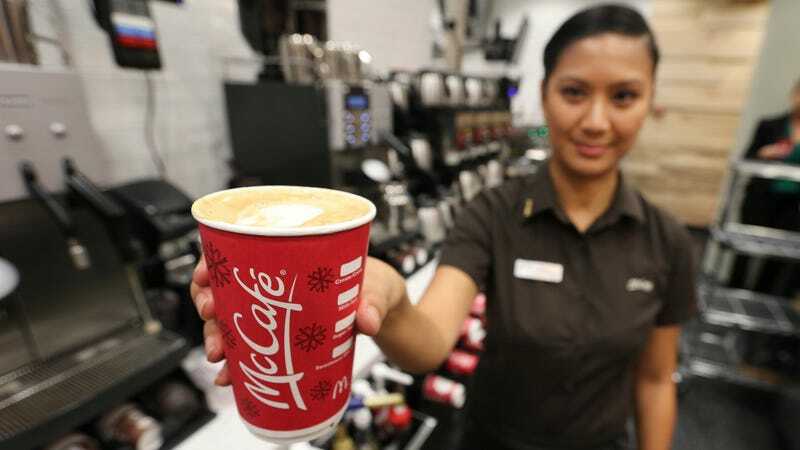 Here’s a story to strike terror in the heart of anyone who has ever gone through a drive-thru (that is to say, pretty much all of us): A pregnant woman in Alberta, Canada, received cleaning solution instead of the latte she ordered at McDonald’s, according to The Toronto Star. The news site reports that “Sarah Douglas says she was taking her son to a baseball tournament Sunday morning in Lethbridge when they stopped at the drive-thru for the coffee.” Fortunately, Douglas realized immediately that something was wrong, pulled over and spit out the swallow she’d taken. Then she went into the restaurant, where “a staff member told her that two cleaning lines were hooked up to the latte machine.” What in the hell? I mean, mistakes happen, but how does something like that happen? Isn’t the cleaning fluid likely bright blue or pink, hopefully unlike latte fluid? Douglas, wisely, then called poison control. A spokesperson for McDonald’s has since apologized. Beyond that, “Alberta Health Services says public health officers are investigating,” but “McDonald’s says a health inspector has visited the restaurant and is not investigating further.” We’ve all had messed-up orders at the drive-thru (“Hey, this isn’t diet!”) but this is extreme; fast-food lunch fans, maybe double-check that order next time.